The ancient castle and village of San Niccolò is located on a hill overlooking the valley of the Solano torrent, where it is crossed by a stone bridge and surrounded by forested slopes. 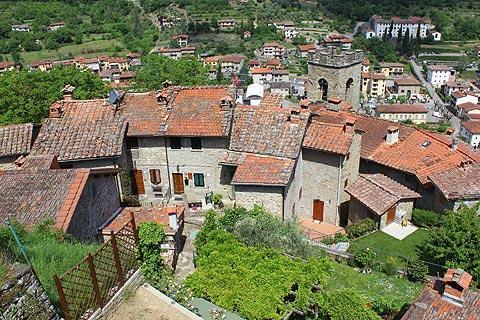 It falls within the Casentino district of Tuscany to the east of Florence. The historic centre of Castel San Niccolo is very small - little more than a ring of houses around an ancient castle and church - but also very picturesque, with traditional stone buildings nestled in the surrounding woods, so we suggest you find the time to explore when you are in this region. 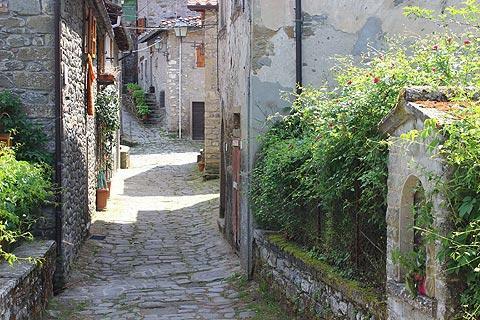 The village below Castel San Niccolo, once called "Borgo alla Strada" and today called “Strada in Casentino", arose outside the castle walls. The more recent development of the village in the valley below, on the other side of the river, is of much less interest to visitors. While it is possible to drive across the bridge and to the top of the historic village, we recommend you park next to the old bridge below the castle, and walk up through the lower part of the Castel San Niccolo next to the river and follow the path through the woods up the hill to the castle and historic centre - then you will see the lower part of the old village as well and also appreciate the setting better! After passing through the forest you enter Castel San Niccolo through a gateway beneath a tower with a clock dating from the 14th century*. * R. Giorgetti tells us that "the first mechanical tower clocks appeared in the middle of the 14th century. These were large and set in motion by enormous weights, and their production was comparable to the construction of a large building. In Italy in the mid-14th century the towers and steeples of the most important cities were equipped with public clocks: in Florence in 1353 the first public clock was installed, on the Tower of the Palazzo della Signoria"
Over the ancient gate clock is the parish church of Saint Nicholas, now home to the Museum of the Civiltà Castellana. One notable feature of the main square in old Castel San Niccolo is the presence of the so-called “Logge del Grano” [Lodges of Wheat], with arches made of stone and a covered pavilion. If you stroll a short distance along the alley to the left just after entering the villgae you can see the traditional communal bread oven for Castel San Niccolo. Nearby you can see the Chapel of the Visitation, containing a 17th century painting of the Immaculate crowned by two angels and Saints John the Baptist and Francis. The painting is located above the altar on the right. Also important in the church is a painting by Giovan Francesco Guerrieri from Fossombrone (1589-1657), who did a lot of work in Casentino, painting "The Virgin and Child and St. Anthony of Padua" for the Chapel. Also near the lodges you can see the ancient office of the podesta, now used as the Public Library. 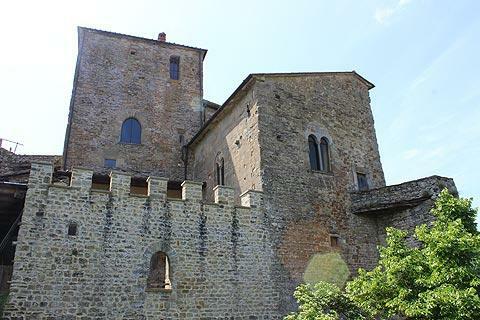 In front of the Podesta's Office in Castel San Niccolo you can see the remaining parts of the ancient Castle. The south-east tower is well preserved as is part of the outer wall, with the original door and one of the mighty towers that punctuated the perimeter. Most of the 13th century donjon also survives, around a small courtyard with arcades. The best views across the village are from the courtyard next to the castle. 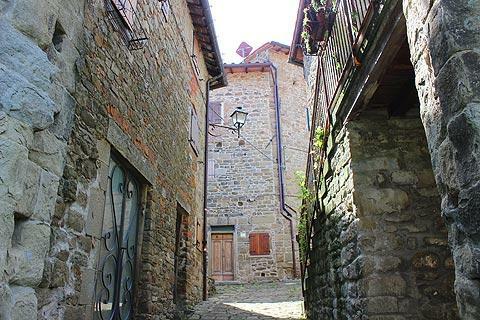 Strada in Casentino also has another important architectural work, the 13th century Church of San Martino in Vado. The richness of the decoration in the church suggests it is also very likely that the church enjoyed the patronage of the Guidi Counts, who had their chapels placed here. The church has three naves, divided into seven bays by six monolithic stone columns and each having different capitals that were made by the Lombard masters. Inside there are also twelve capitals decorated with floral, animal and other motifs. The frescoes which decorate the interior walls are from the Parish Church of Saint Nicholas, close to the castle, and depict the Crucifixion with Saint Nicholas (dating from the 14th century and by the Florentine school of artists). On the left wall, near the entrance, a 17th century oil painting represents S. Simone Stock receiving a scapular of Our Lady. Strada in Casentino (the town below Castel San Niccolo) is famous for its finely worked carved stones, and every two years at the end of August the Biennal of the Worked Stone Exibition is held here, with the participation of sculptors from all over the world. *See also history of Castel San Niccolo and historical Itaian painters for artist notes.